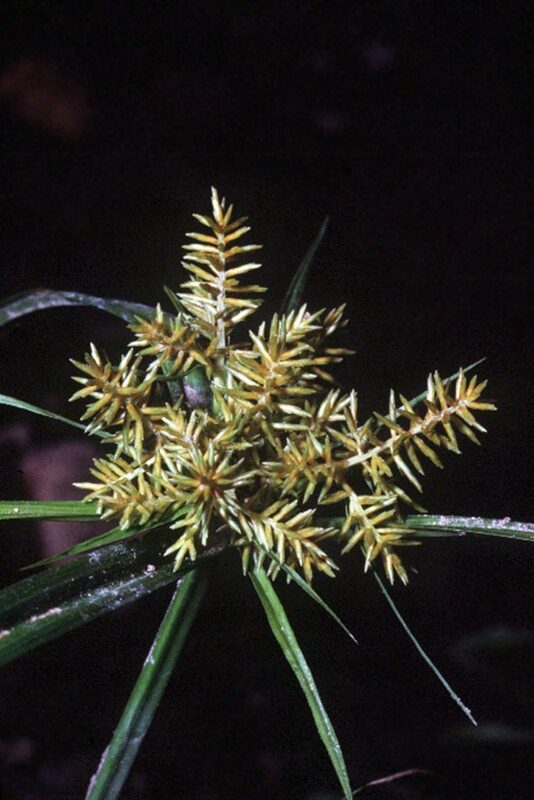 Cyperus esculentus is a perennial, C4 sedge (Downton 1971), 10-70 cm tall, stems 3-sided, stout, smooth; yellow-green; small root tubers on slender rhizomes, colonial, sometimes aggressive in lawns and wet agricultural sites. Leaves basal, elongate, 0.3-0.8 cm wide, conspicuously folded along midrib; inflorescence bracts longer than the inflorescence stalks. Dipartimento di Biologia, Università di Trieste – Picture by Andrea Moro – Località Palazzot, rive del Tagliamento, in una cultura di Soja. , UD, FVG, Italia, – Image licensed under a Creative Commons Attribution Non Commercial Share-Alike 3.0 Licence (CC by-ncsa 3.0) (Accessed 2/2018). 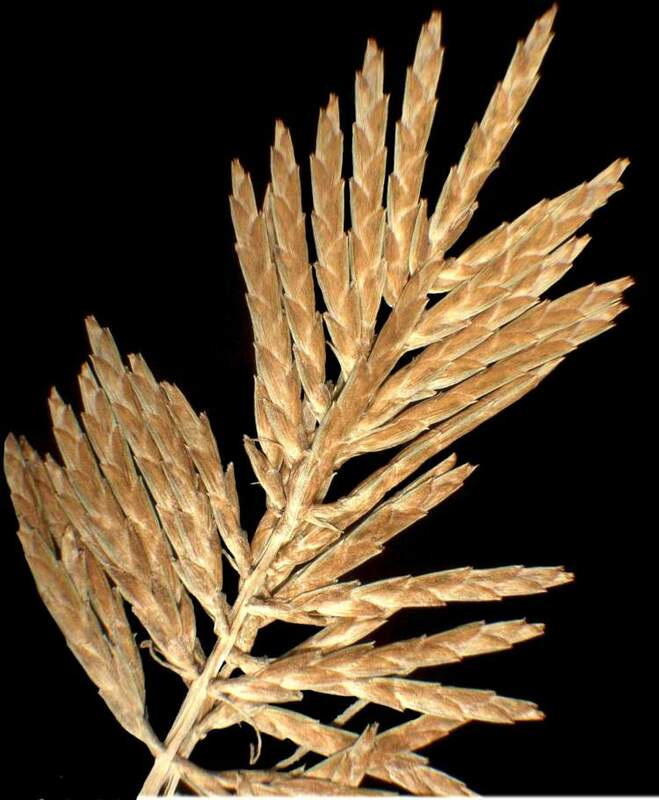 Fruit: Achenes 3-sided, wind pollinated, obligate outcrossing; inflorescence of radiating stalks (rays), to 7cm long, often branched near top; blooms and fruits Aug-Oct. Frequency in NYC: Occasional (probably frequent but not completely inventoried). Cyperus esculentus.Steve Dewey, Utah State University, Bugwood.org Creative Commons License licensed under a Creative Commons Attribution 3.0 License (Accessed 12/2016). Origin: Native and exotic. So far there appears to be no way to tell the difference. Habitat: Open, disturbed, moist to wet soil, roadside ditches and swamps, often a garden or lawn weed in moist soil pH 5-7; moderately tolerant of drought, intolerant of fire, salt and anaerobic soil (USDA, NRCS 2010). 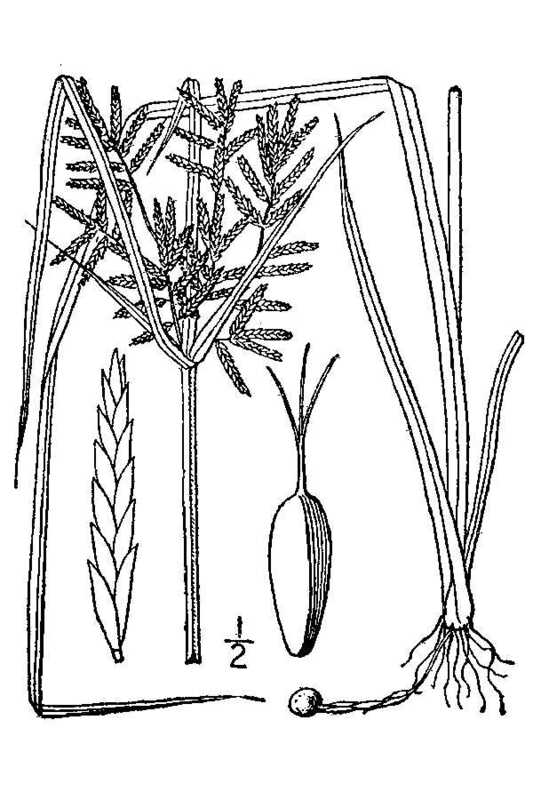 Cyperus esculentus.USDA-NRCS PLANTS Database : Britton, N.L., and A. Brown. 1913. An illustrated flora of the northern United States, Canada and the British Possessions. 3 vols. Charles Scribner’s Sons, New York. Vol. 1 (Accessed 4/2015). Notes: Seeds and tubers eaten by waterfowl, game birds and songbirds (Martin et al. 1951). Plants and rhizomes die back in winter, leaving dormant tubers. These sprout in May-June (photo period longer than 14 hrs), forming new rhizomes and above ground plants. Tubers must overwinter to sprout. Few survive more than one winter (Mulligan and Junkins 1976). 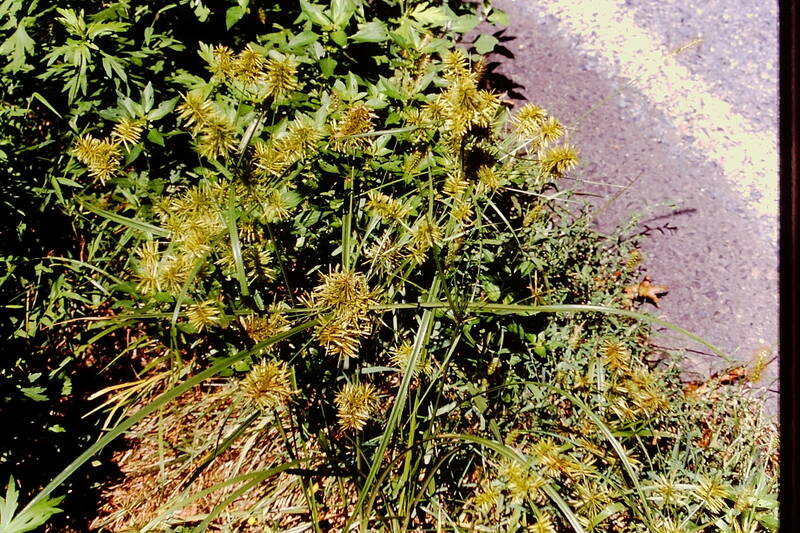 Appears very similar to C. strigosus, but differs in colonial habit and scaly rhizomes with tubers. Attacked by the fungi Phyllachora cyperi and Puccinia canaliculata winter (Mulligan and Junkins 1976).